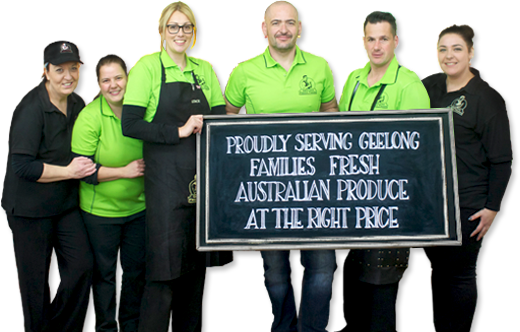 Geelong Fresh Foods is a family-owned and operated fruit and vegetable shop, stocking fresh organic produce. The gourmet food store is owned and run by two brothers and a sister whose mother taught them everything they know about quality fresh food. With five generations of experience growing lettuce, cauliflower, cabbage and citrus, the family has fruit and vegetables running through their veins. Each night at midnight one of the brothers is responsible for driving to the Footscray market to collect a variety of fruits and vegetables to stock the shop each day. As passionate fruiterers, the family takes great pride in providing quality organic produce at the right price. Fruit and vegetables should be a staple in everyone’s diet and buying fresh food shouldn’t break the bank. Exceptional quality food, affordable prices and friendly staff keep customers coming back to stock up on their groceries. Many customers are considered “regulars” and know staff by name, sometimes popping in just to say hello! Geelong Fresh Foods is recognised as a leading provider of fruit and vegetables and is open seven days, stocked with groceries to keep your family fueled with healthy and vibrant food. The store is also stocked with a variety of health foods, including gluten-free products and superfoods. For enquiries or to make a special request, please contact Geelong Fresh Foods.